The wedding cake is one of the most expected moments at a wedding. If you have difficulties in choosing the right one, check out the wedding cake ideas and trends below. Forget about traditional cakes with boring favors and icings, as the new classic is a delicious 3-layer cake. More and more couples choose a classic and tall wedding cake featuring a simple design. The difference is made by special touches such as topping the cake with a crystal monogram of the newlyweds, using natural flowers or silver beads for decorations, or other original detail. Along with the traditional round shape, the most popular shapes for wedding cakes are octagonal, hexagonal and square designs. Even if they are simple, these atypical shapes provide a more modern look to the delicious dessert. Lately, more and more multiple-layer wedding cakes come in layers placed directly one on top of the other, without using pillars, separate plates or stands. In case the wedding cake is too heavy, the use of pillars becomes a necessity, but they can be camouflaged with fruit or flowers, creating the impression that the cake`s layers are one on top of the other. You can choose a wedding cake that reflects the wedding`s décor. The most popular colors are pink, lilac, blue, pistachio and cream icings. For a unique accent, decorate with colorful satin ribbons and flowers. Wedding cakes can be successfully decorated with fresh or sugar flowers. The most frequently used flowers are roses, tulips, gardenias, orchids and daisies. A great idea is use rose petals to make a monogram with the newlyweds` initials. 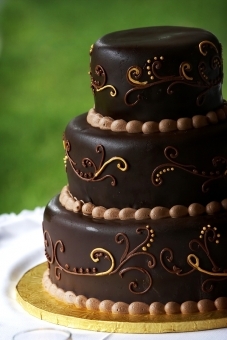 Regardless if it is all-chocolate or only covered with chocolate frosting, chocolate wedding cakes are on the top list of choices. Be creative and use tasty fillings such as raspberry, passion fruit, mint or orange mousse. For a casual wedding, cupcake wedding cake can be the perfect choice, as there is one cupcake for each guest. In addition, the newlyweds should have a small cake for cutting the first slice together.